I reviewed Fumiaki Miura’s first concerto disc, issued on the Avex label, in September. An impressive release, I nominated it a Recording of the Month. 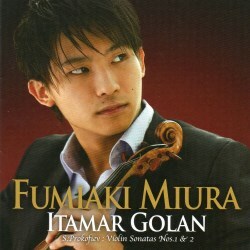 His very first recording, the two Prokofiev Violin Sonatas, was made when he was only 17 for Sony Japan, in 2010. I am now very fortunate to have the opportunity to review it. At the age of 22 Miura has already shown himself to be a formidable and impressive violinistic talent but sadly seems to confine his activities mainly to Japan. He was born there in 1993, son of a concertmaster, who gave him his first lessons from the age of only three. In 2008 he was admitted to the Toho Gakuen School of Music in Tokyo, studying with Tsugio Tokunaga. Recently he has been working with Pavel Vernikov at the Vienna Conservatory. In 2009 he became the youngest ever winner of the Joseph Joachim Hannover International Violin Competition, where he won both the Music Critics' and the Audience Prizes. Prokofiev’s Sonata for Violin and Piano No. 1 in F Minor Op. 80 had a lengthy gestation period. Although begun in 1938, it was another seven years before it was completed in 1946. During this time the Second World War came and went, and the composer was afflicted with health problems. These momentous events inform the character and complexion of the work. It was premiered in 1946 by David Oistrakh and Lev Oborin, the violinist becoming its dedicatee. Miura and Golan capture the dark, portentous and menacing opening of the Sonata. Towards the end of the first movement, the glassy, diaphanous runs on the violin evoke a strange eerie effect. The brusque declamatory chords of the second movement have real bite and impact, with an almost mocking character. There’s a coarse, angular feel to the music, with the violinist drawing a big sound from the fiddle. Like balm to the ears, the Andante brings an element of calm, assuaging the situation. The players conduct a dialogue, and their superb dynamic control, as the music dies away to nothing, is admirable. The finale begins forcefully, but ends with an air of resignation. The Sonata for Violin and Piano No. 2 started life as a flute sonata, composed in 1942. Oistrakh requested that the composer transcribe it for violin. This Prokofiev did, and it was completed in 1944. Again it was premiered by Oistrakh and Oborin in Moscow in June of that year. Whilst the piano part adhered to the original, the violin part underwent some changes. The work is dedicated to Joseph Szigeti. The Second Sonata certainly complements the more harrowing Op. 80, and offers plenty of contrasting elements. In the lyrical first movement, the violin sings a rhapsodic melody, weaving its way through the piano writing. The Scherzo is witty and capricious in this duo’s hands. Miura employs some dazzling, crisply articulated bowing. A short, melodically generous Andante follows. The finale brings an impressive end to the Sonata, with both players surpassing themselves in terms of panache and energy. Itamar Golan is a sympathetic and engaging partner. The sound quality of the recording is top-notch, and the balance between violin and piano is as you would experience in concert. Liner-notes are in Japanese and English. This version stands shoulder to shoulder with the best in the catalogue. Miura’s stunning playing, well-grounded technique, innate musicality and interpretative maturity are remarkable in one so young. He clearly has an affinity for Prokofiev’s music, and I hope one day he will record the composer’s two violin concertos. At the moment he appears to be Japan’s best kept secret, but I hope for not too long.